I live in New Mexico, which is Broomstick Skirt Central. 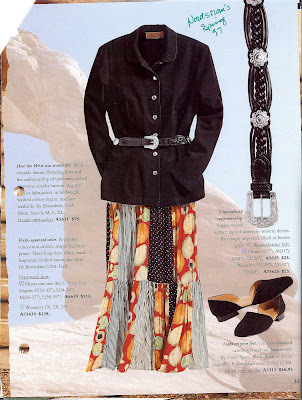 After all, this is a style based on Native American clothing of the Southwest. It was also adapted decades ago as an integral part of the Santa Fe Look that was later appropriated by Ralph Lauren. The broomstick skirt is a style that comes and goes in the rest of the world, but it lives here all the time. Apparently, they're back again so it's time for me to spill some of my experience with this style. I'll be doing this as a series because I've gathered a lot of information over the years and I don't think it's necessary to go on and on with one single post. I did scan some examples of broomstick skirts I've collected over the years and sprinkled them throughout this post, and I'll continue to do so through the series. Perhaps they'll serve as inspirations for your projects. Note: I've cleaned up and reposted the scans, so they look a little nicer now. Most people think of broomstick skirts as tiered, like the examples in this post, but they don't have to be. Broomstick actually refers to the technique of pleating, not the type of skirt. Actually, I think those tiered ones can be unflattering to many people, making them look heavy. I like this pattern because the tiers are fairly close to the body through the waist and hip areas, and increase in circumference in the lower tiers. 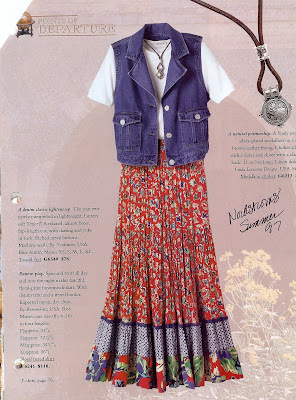 I know there are a lot of tiered skirt patterns out there in sewing land and on the internet. You could even work up your version of this skirt on your own. But this is a good one if you want to buy a pattern. 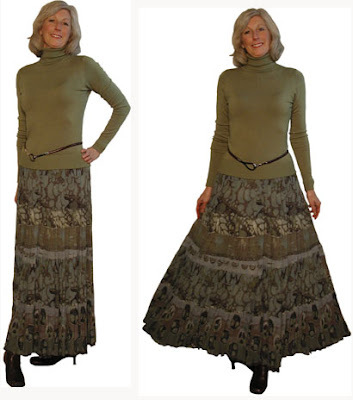 However, my favorite style of broomstick skirt is a gored skirt developed by my friend Leslie several years ago. She's given me permission to provide the instructions, but essentially it's a gored skirt made of many narrow panels and customized to your measurements. Since the instructions are kind of lengthy, I'm going to go over this in a separate post. Don't hold your breath, but there might even be a tutorial! As I mentioned earlier, the pleating technique is what makes this style. I don't hold with instructions that tell you to twist the skirt until it rolls up on itself and let it dry. Doing so will give you a skirt with a pattern of wrinkles, but the look is different. 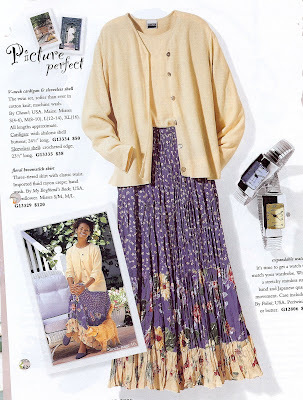 Call me a purist, but to me it's not a broomstick skirt unless you starch it, roll it onto an actual broomstick, and let it dry into dozens of tiny vertical pleats. I even went to Home Depot and bought real broomsticks to dry mine on! I'll also do a post about that. I've made a bunch of broomstick skirts over the years, both tiered and gored. I've made them from cotton in the past, but I've come to the conclusion that it's not the ideal fabric, especially the usual weight sold in the big box fabric stores. True, cotton is a natural fiber and it takes the pleats well, but cotton can be stiff, and that stiffness can add visual weight to the wearer. So I prefer rayon. Even when starched, rayon has a nicer drape that's more flattering. So there you have it for now. I'll follow up with posts on how to draft a gored skirt to broomstick and how to do the pleating. Let me know if you have any other questions on this subject, and I'll add them to the series. What fun! Thanks for the introduction and all those photos/scans! Looking forward to hearing more. Thank you for this information. I can hardly wait for the next installment! I love brookstick skirts, even though I'm a larger size. Thanks for the input. I purchased some light weight cotton and rayon to day to do this. You do starch when the skirt is wet, right? Yes, the starching takes place when the skirt is wet or at least very damp. I'll be posting more on that later. Wow! You really do have a wealth of knowledge regarding broomstick skirts. I'll be back for the rest of the series. Thank you for this. I'm looking forward to more! My question is--where has rayon gone? It seems difficult to find, except that which is batik. Any online sources that has pretty rayon? Wow, this looks like fun. I tried a broomstick skirt type thing years ago, but twisted. It was nice but it wasn't a broomstick skirt as I think of them. I will be folllowing along. And yes, where has all the rayon gone? I have printed out the next post about drafting the pattern. I am confused about the x measurement. Obviously it can't be the waist measurement. Is it the hip measurement plus 2? Gosh sharon, you are fast. I only had the drafting post up for about 5 minutes before I took it down. X equals half of the panel pattern's top edge. To get X, take your fullest hip measurement and add 2". Then divide that number by 2 times the number of panels. 10, 12 or 14. Add 1/4". When you draw the panel pattern, you draw a line for the length. Then you draw 2 x lines on one end of that Length line and 2 y lines on the other end. I think the second drawing shows that. Anyway, I'm going to go ahead and post the drafting installment since you're already working on it. I had planned to add a picture of the finished skirt, but I can edit for that later. Actually it's the first drawing of the post. I'm re-posting that installment now. I'm a big fan of this skirt, but I've had to face that here in my urban, Northern big city, the style evolves. My favourite fabric for them is silk, and I like gores (maybe 5 will do) more than tiers. I buy them from Wintersilks and shorten them, b/c they look more current (toi me) just below the knee. Long is good too; I love to wear a low calf length BSS with a linen tee and lots of jewelery. The pics posted look a bit dowdy to me. Duchesse, I prefer gores over tiers too, less country looking. We still wear them kind of long out here especially if worn with boots, but I'm going shorter on most of my skirts now, so broomsticks won't be an exception. I see your point on the pics, but sewers tend to go for interesting color combinations, etc. and those certainly show that. Also, if you're going to combine fabrics in a tiered skirt, those examples showed ways to do it without emphasizing wide horizontal lines. Myself, I'd style them much differently--a simple knit top and lots of jewelry. I'm living far from my native Southern habitat and enjoying life as a Desert Diva. I've reached the half century mark and beyond: living well is the best revenge. I've been a huge sewing fan since junior high, when Mom bribed me into Home Ec by promising me I could use her sewing machine if only I enrolled. The rest is history. I've always loved dolls! This is one of a series of Genes based on old Western movies, "Shooting Star".